Branch transactions are declining. How should your branch design team respond? In the wake of declining branch transaction volume, most analysts see a continuing, revised role for the branch. A consensus view is emerging that branches in the future must become more sales-oriented as teller visits wane. Yet, what does this actually mean? After all, branches have always been opened and operated for the express purpose of obtaining new customers or capturing greater wallet share from existing ones. 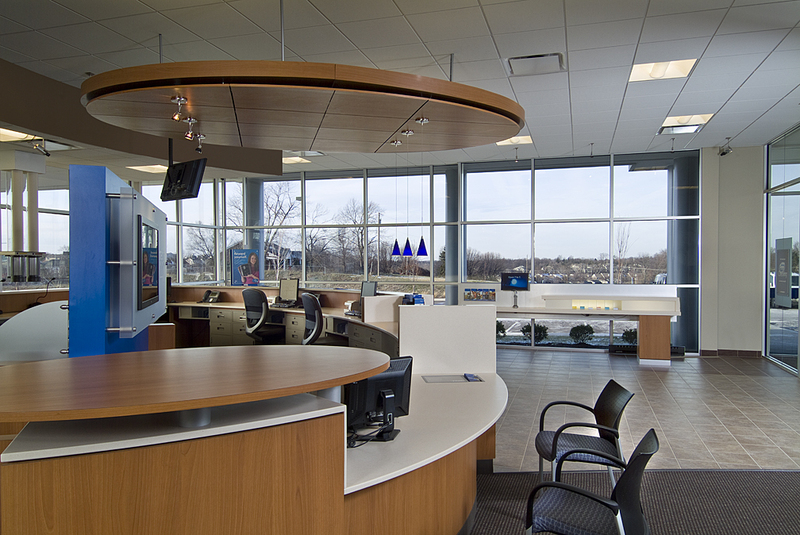 Moreover, financial institutions of all types have spent countless millions of dollars on merchandizing fixtures, architectural flourishes, and high-end finishes intended to enhance the sales performance of their existing branches. 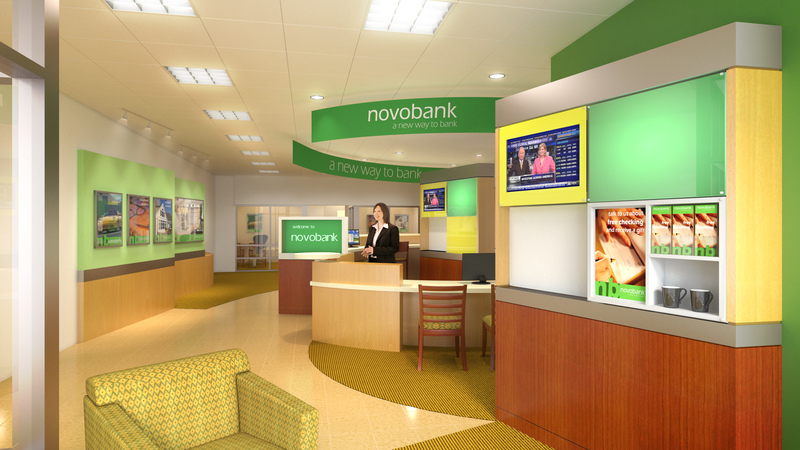 How will the next generation of sales-oriented branches differ from today’s? 1. Design for a smaller staff. Obviously, lower transaction volumes can be expected to result in fewer branch employees. However, capitalizing on this change will require moving beyond conventional branch design assumptions. Historically, branches were designed primarily to accommodate a flood of teller transactions, in a setting devised to maximize security. The teller line, with its associated queuing area, was physically remote from the “platform” area and the staffing was completely separate. Most present-day branches perpetuate this basic scheme, creating discrete activity zones with isolated pockets of staff addressing separate streams of customer traffic. As transaction volume—and therefore, staffing—declines, this format becomes increasingly inefficient and outmoded. In smaller branches, efficiency arises from increased flexibility in allocating limited staff resources. A team composed of cross-trained generalists, who can adapt “on the fly” to customer requests, is ideally suited to maximize customer satisfaction and capture sales opportunities. This staffing model thrives on ease of movement and effective communication among team members. An efficient small branch design supports this operating model by keeping staff members in close proximity. 2. Set aside tired analogies. Ironically, one impediment to a truly sales-oriented branch could be an overly literal effort to make branches operate like, or look like, retail stores. Analogies to retailing can be useful, especially in helping to pose questions or challenge assumptions. But where the analogy departs from the reality of your business model, it can prove counterproductive. Consumers do not consider your services to be products. They do not come to the branch to shop. They come to get something accomplished. A good customer experience hinges on how well this interaction is accomplished. Sales opportunities are imbedded within the service request and your best avenue to enhanced sales is improved dialogue. To the extent that signage or merchandizing promotes inquiry and dialogue it has value. But outdated concepts, such as “putting the milk in the back of the store” have little basis in reality—for you or your customer—and should be retired. Instead, focus on developing answers to the real question of how the branch environment can be shaped to promote successful interactions between customers and sales-capable staff. 3. Establish cost control as a first-order goal. Too many branch designers resent cost parameters as a constraint on their ability to create effective retail environments. Yet, a correlation between expensive branches and sales success remains speculative at best. Good design practice begins with an understanding of the business case for the branch and the financial dynamics underlying it. As transaction activity moves to other channels, operating expenses and capital costs per branch need to be driven lower. Lower staffing costs are a start, but reduced square footage, alternative finishes, and other tactics such as leasing rather than owning could all be part of a new lower-cost approach. Your design team needs to accept the search for these solutions as a top priority. New branches can, and should, achieve improved sales focus as transaction volume declines. Success will come only if you are willing to ask your design team to find appropriate new solutions. Tim Ryan is an architect and business consultant. He has been advising financial institutions on branch design for more than 25 years. As managing partner of Branch Development Group, Tim is responsible for the company's branch design work and client consulting.